Synopsis: Movie star Vincent Chase, together with his boys Eric, Turtle, and Johnny, are back – and back in business with super-agent turned studio-head Ari Gold on a risky project that will serve as Vince’s directorial debut. Review: I’ve been a loyal HBO subscriber for years but I’m one of the select few that’s never seen an episode of True Blood or made it through the entire series of The Sopranos. I especially avoided Entourage which seemed a little, well, douche-y for my tastes. I’ve known about the big screen continuation of Entourage (which had a successful run on HBO from 2004-2011) for a while and I tried to do my homework on this one, I really did. I even had the discs of the first season staring me down on my night stand each evening before I made the judgement call to watch Friends on Netflix instead. So I approached the screening of the film with some trepidation. Would I be completely lost with the characters, not knowing their backstory? Would the bro-tastic vibe I got from the trailers send this one up, up, up into the macho testosterone grunting stratosphere? Most of all…would I enjoy myself? The answer to these questions of world importance were no, not really, and, surprisingly, yes. Sensing that their movie may be playing to a specific niche crowd of loyal fans, Warner Brothers and HBO have wisely made it clear in the ads and promos for Entourage that even if you never watched the show you’ll get a kick out of the raunchy debauchery of a bunch of L.A. living dudes that party hard, love the ladies, and work for the kind of bank bucks that keep them living the big life in spacious mansions that seem to always have a naked starlet in the pool waiting for them when they come home. Truth be told, this isn’t my kind of movie at all but in many ways it’s one of the smartest (if slightest) comedies of the year so far. Its insider look at Hollywood and numerous celebrity cameos rival Robert Altman’s 1992 film The Player but the comparisons end there. While Altman’s film is a twisty noir that savages the entertainment industry, Entourage keeps things sunny and free spirited. Playing like an extended episode of the series, the film follows star Vincent Chase (Adrian Grenier) and his entourage: half-brother Johnny “Drama” (Kevin Dillon), manager E (Kevin Connolly), driver/assistant Turtle (Jerry Ferrara, Lone Survivor), and former agent now studio exec Ari Gold (Jeremy Piven, Edge of Tomorrow) as they scramble to finish Vincent’s directorial debut that Ari greenlit and is now way over budget. The film in question is a sci-fi take on Jekyll & Hyde for the new millennium and everyone that sees it thinks it’s great. Not being familiar with the show I’m unsure if it’s normal in the series to ape on Hollywood vanity projects by having everyone fawn over a film that’s fairly terrible looking but yeesh…the little we see of Vincent’s Hyde is overproduced goulash. The film nicely divides it’s time between the pressure Vincent has to finish the film, newly promiscuous E’s impending fatherhood with his former flame (Emmanuelle Chriqui, Fort Bliss), Drama’s insecurities as he struggles to get out of his famous siblings shadow, and uber-wealthy Turtle’s romantic pursuit of mixed martial artist turned actress Ronda Rousey (Furious 7, The Expendables 3). All four actors know these characters inside and out and the years between the series finale and the film hasn’t seemed to lessen their interest in taking things to the next level. Piven, who nabbed three Emmys for the show, is the unquestionable star of the show. The actor has had his fair share of being put through the Hollywood wringer and maybe that’s the reason why he’s able to sink his teeth into Ari so well. Short-tempered and hot under the collar, he’s especially amped up when he has to beg for more money for Hyde from the film’s financer, a deep-pocketed Texan (Billy Bob Thornton, The Judge, looking like a withered bobble head of his former self). When the Texan sends his nebbish son (Haley Joel Osment, Tusk, who has now completed his transformation into a Garbage Pail Kid) out to Hollywood to get a feel for the film, it causes a bunch of problems for Vincent, Ari, and the gang. Though he hasn’t directed a feature film since 1998’s forgettable Kissing a Fool, Doug Ellin’s experience behind a camera on the Entourage series made him the right choice to write and direct…also helps that he’s the creator of the show. I liked that the film takes place almost entirely in the bright California sun and features a swell soundtrack that is easy on the ears. Though it does feel like a super-sized episode, it doesn’t feel like a quick cash-in on the popularity of the television show however it’s squarely targeted at fans…which can make the rest of us feel a little left out at times. That’s not the fault of the film, per se, and I’m not sure really what could have been done to fix that piece short of requiring viewing of the eight seasons before admission. 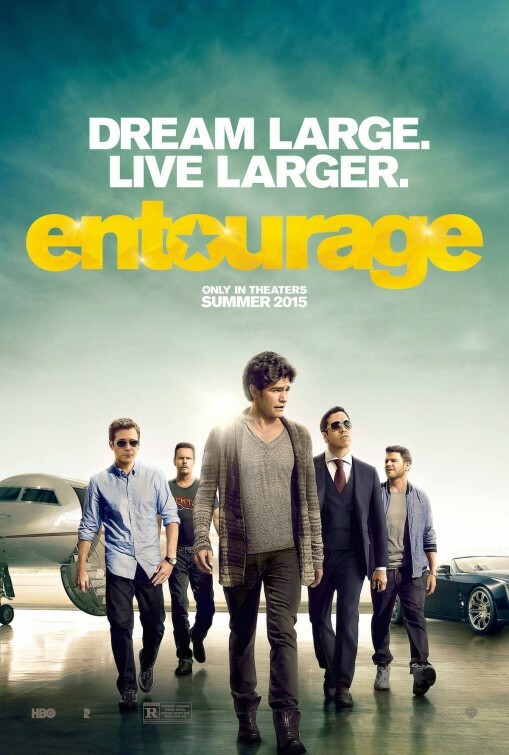 Better than I thought it would be, Entourage makes a solid bid for the attention of audiences that need a break from the bonkers mayhem of San Andreas, Mad Max: Fury Road, and Avengers: Age of Ultron. And after making it through the Pitch Perfect 2 festivities, men can hopefully get their girlfriends/wives to repay the favor and tag along to their Entourage party. Very good review. As someone who liked the show for the most part, I’m looking forward to this.